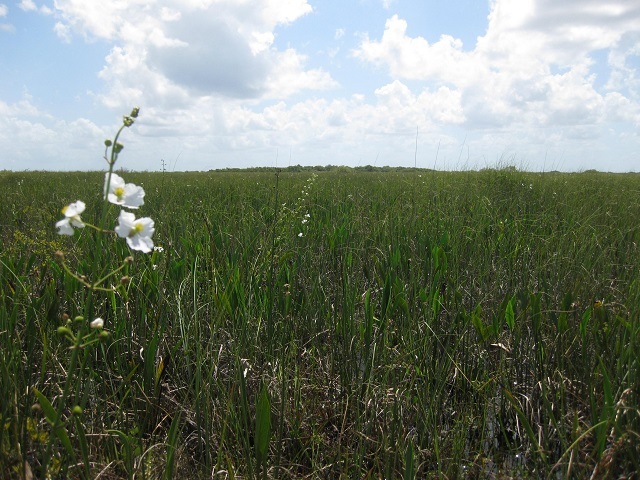 An airboat is the best way to access the more than 60,000 acres of sawgrass marsh and hydric hammock tree islands that make up the interior of these two Wildlife Management Areas (WMA). Together with the 670,000 acres of adjoining Everglades and Francis S. Taylor WMA, this vast protected area constitutes one of the largest intact properties of the Everglades ecosystem. A drivable levee system bordering these WMAs provides glimpses into the ecosystem, and gives visitors opportunities to enjoy relatively uninterrupted viewing of Green Herons, Black-necked Stilts, Purple Gallinules, along with occasional sightings of American Bitterns (winter) and resident King Rails. Keep an eye skyward also; it is not uncommon to see Swallow-tailed and Snail Kites, Northern Harriers (winter) and Bald Eagles. The L4/L5 levee system, which begins at US 27 and runs east/west approximately 21 miles along the southern border of these WMAs, is bisected by levee roads along the Miami Canal at the boundary between these two sites. The Miami Canal levees can also be driven, providing additional opportunities for wildlife viewing, but the road on the east side has no outlet and you will have to turn around. The L4/L5 road is a remote, long drive that ends on rural Huff Bridge Road. The levee system can be confusing, so make sure you obtain area maps before you go, and fill up your gas tank and water bottles before setting out. During your visit, you can stop by the informational kiosk located in Rotenberger WMA at the intersection of the L4 and Miami Canal levee. Seasonal hunting takes place at both sites please click here for details.